Before you start any of this, I want you to have your downloadable product ready to do. Get some ideas under #3 in this post. If you want to sell something that requires them to click a specific URL to access their purchase, I recommend using ConvertKit. 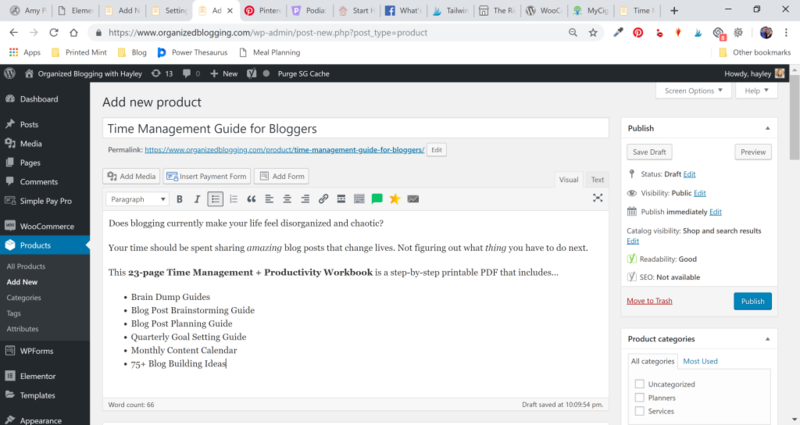 For example, I sell digital blog planners using Google Sheets, which are not technically “downloadable.” ConvertKit is the best option I’ve found to send your customer a specific email based on the product they purchased. After your customer completes their purchase, you can email them the link where they can access their product. Simple! 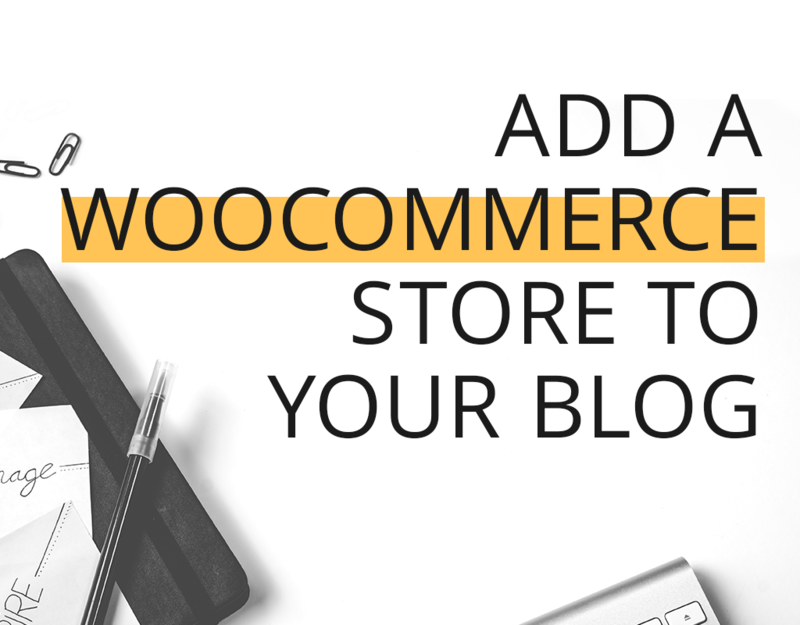 Click here to download the WooCommerce plugin for WordPress. Then, upload it as a new WordPress plugin and activate it. BOOM, Step 1 is done! After downloading the WooCommerce plugin, there’s a nifty setup wizard to select all your store settings. I like Stripe over PayPal, only because I’ve had terrible customer service from PayPal in the past. I didn’t choose any of the “recommended” add-ons they suggest. You’ll want to use your own email provider (MailChimp isn’t my first choice) – my recommendations coming up next. It’s better for you to elect your own tax settings if you’re selling digital products. More on that in Step 4. Before adding a product, make sure you connect your email service provider with WooCommerce. Here are instructions for MailerLite and ConvertKit, my two email service provider recommendations. This is the name of your product. Feel free to include keywords for SEO purposes. What’s your product do? Who is it for? What problem is it solving? Include as much detail as you’d like here! I like to always have my products on sale – it makes customers feel like they’re always getting a deal. So, the regular price is “market value” and the sale price is what I’m actually selling it for. Enter the name of your file, then click “Choose File” and upload your product to your blog’s media library. Then choose that file for this section. How many times the product can be downloaded for that customer. It’s a good idea to set a limit so that someone can’t send the link to a friend and allow multiple downloads. How long before the download link expires. Don’t set this too short, as someone might wait a few days or weeks to download their purchase. Laws vary state-by-state on whether or not digital items are taxable. This article can help you figure out whether or not you need to include tax. This is used on excerpts across your websites and only needs to be a sentence or two long. If you have the YoastSEO plugin, you can edit the snippet that displays in search! Make sure to fill this with keywords. On the right-hand side, there are even moooore options for your new product. Add a new category for your product. Think about other products you might sell in the future and how you can keep them organized in categories. Feel free to add/select more than one! Another way to classify your products. Maybe you have different colors or sizes – add specifics here! This shows up for me because I have the ConvertKit plugin on my website, but if you have another email service provider, they may show here. 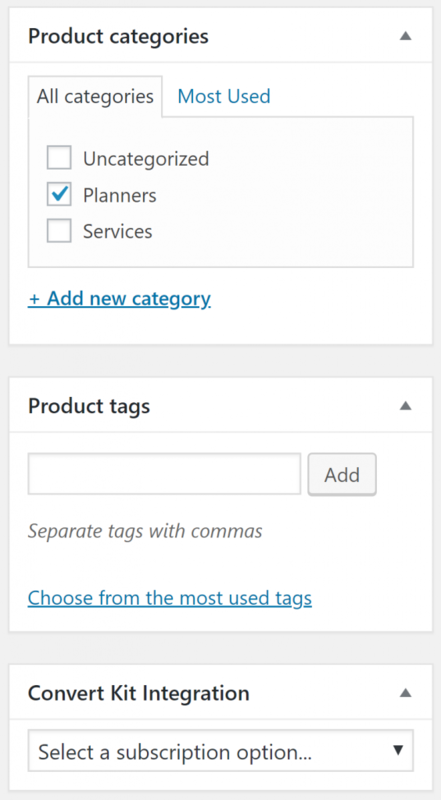 You can connect your product to a specific form or tag so the customer will be added to a workflow! Add an image of your product. I recommend using a 1:1 / square image. If your product is printable, print out a copy and put it on a clipboard or lay it on a nice backdrop and take a picture. People like seeing the product in use! I suggest customizing your store after adding a product because it’s easier to adjust settings on content you’ve already created! 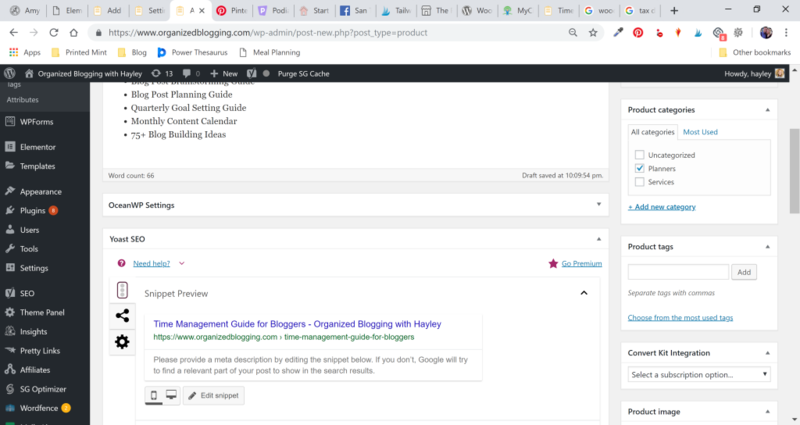 After downloading the plugin, WooCommerce will have created several pages for you in WordPress, including Shop, Cart, Checkout, and My Account. Depending on your theme, you can customize colors and fonts of your WooCommerce store. Many themes work with WooCommerce, but I’ve loved using the free OceanWP theme + Elementor Plus to customize my store! Customization settings are often found in Appearance > Customize > WooCommerce. There will be options to change colors and fonts across your store and customize your look to match your branding! Elementor Plus gives you lots more WooCommerce customization options with a simple drag-and-drop editor to build your store from scratch. The biggest feature you get with Elementor Plus is the ability to create your own “Add to Cart” button anywhere on your website. To create your custom “Store” page from scratch, go to Templates > Theme Builder > Add New > and choose “Product Archive.” Just name it “[BLOG] Store.” Then, it will take you into the Elementor editor. If you have Elementor Plus, scroll to the bottom of the widgets and there will be a section for WooCommerce with extra customization widgets. I like creating my own product displays (like in my shop here) by using the following widgets: Image + Title + Text Editor + Add to Cart Button. If you got through all 6 steps, YOU DID IT! 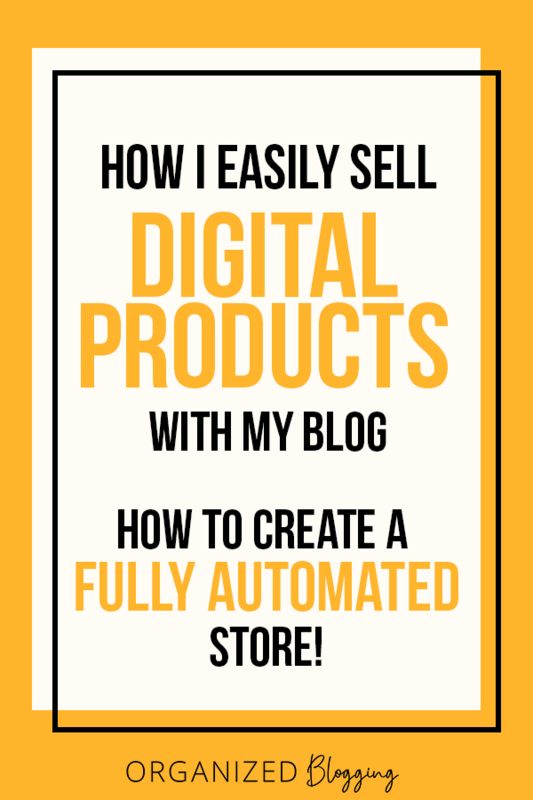 Now, go create some more products for your store and start promoting your products on Pinterest and social media! If you were skimmin’, don’t forget to pin this post for when you’re ready to dive in!